Today my outside temp reading on my 08 Tiburon stopped working. It currently shows four dashed lines where the temperature is supposed to be. At the same time my AC and HVAC controls also have stopped working. After reading thorough a couple of threads it seems that the ambient air temp sensor in front of the radiator might be out. 1. Unplugged the ambient air temp sensor (had to remove the black plastic between the front of the radiator and the front bumper) - still shows dashed lines. 2. Checked AC fuses under the hood and under the dashboard. 4. Disconnected the battery and reset the ECU. What I'd like to know is will a faulty sensor cause the AC controls to also stop working? Should I order a new one? Any help would really be appreciated. 2008 V6: NGM 360cc reflash stage 2 supercharged, AEM water/meth injection, Custom FMIC 26x7x2 (Type 118 Frozenboost), Allstar ALL36111 reservoir, Borla Exhaust, DC Headers, K&N Cold Air Intake, Solid motor mounts, Megan Racing SS coilovers, NGK Iridium 1 step colder Spark Plugs & wires, Weapon-R catch can, Ralco Short Throw Shifter & bushings, FX350 clutch, Fidanza flywheel, XG350 front BBK with Hawk HPS pads & SS lines. I would check the FSM, see if there are tests for the sensor and wiring. Then you have a better idea on what needs work/ replacement. The only other information that I've come across in the service manuals and parts sites are the following two attachments. The first shows where the ambient temp sensor connects and the other shows some DTC codes which I guess I need to scan for. I'm most likely going to order the $20 and hope that it works. I'll post my updates. Just a quick update. I installed the new ambient air temp sensor (96985-3X000) but unfortunately the problem persists. When that didn't work I tried plugging the old sensor back in and for a brief period of time I did see a temperature reading on the outside temp gauge so I'm almost certain that this part causes the AC/HVAC controls to work. I've checked all the fuses again including the grounds to different parts (gauges, intercooler pump, HIDs etc). Those all seem to be fine. Any recommendations on what I should do next? From a sonata book, there are up to 8 fuses related to the HVAC. 3 are under the hood (2 are fusible links), 5 under the dash. AC compressor has 2 relays involved under the hood.....engine control and AC. The EC relay is part of the feed for the AC relay coil. You can also determine the AC clutch feed wire, start the car, then jumper the feed to the relay output (diagram is usually on the relay itself and your wires will be 30 and 87 on the relay). This will bypass everything else and just engage the clutch. measuring the resistance of the original sensor would have told you if your problem was there or else ware. I would bet on an open in the harness or a loose pin terminal since it worked momentarily when you plugged the old sensor back in. I got myself a multimeter and tested the ambient sensors. Turns out that they're both providing a resistance reading. I've tried numerous attempts at testing the wiring and harness to the ambient sensor. First I realised that the horn + ambient sensor share a harness in front of the radiator. With the key in acc, I used my multimeter to test if that harness is receiving power. I attached the black negative probe to a good ground and tried to find a voltage with the red probe. One of the pins returned a positive voltage. Also, the horns themselves are working so that harness is getting power. Next I tried to test for a voltage coming from the ambient temp sensor harness itself. I probed both pins for voltage and did not get a reading. This is my first time debugging an electrical problem so I'm not sure if I should have tested for current as well. The wires and pins themselves don't look damaged or loose so I'm not sure what to make of it. Finally, I used the OBDCarDoctor app to scan for codes. 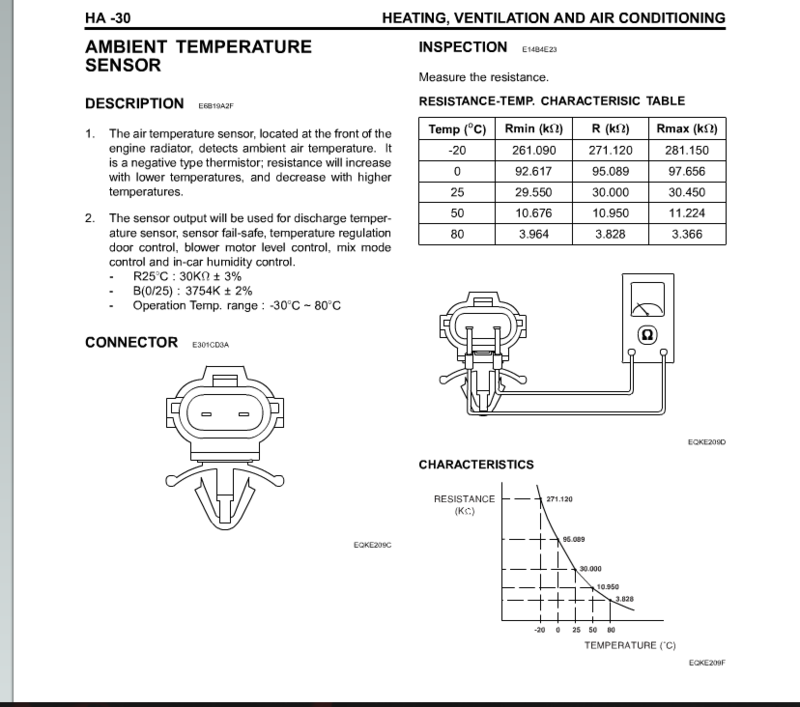 On the menu page I am getting a reading for my IAT temp but the Ambient Air Temp value is reading N/A. I pulled one fuse one at a time for the AC and blower and still no luck. Any recommendations on what to try next? Just a follow-up on this. I've still not been able to figure out a solution. I've once again checked the ambient air temp sensor. I'm now a bit more familiar with how to use my multimeter so I now know for sure that the ambient sensor is working and that there is a very small current going through the wires to the ambient sensor. I've checked all the fuses and the wires from the AC control module to the front fascia. I have a manual AC system and based on all the service manuals I've gone through only the automatic AC systems rely on the ambient temp sensor to function correctly. I'm not sure where else I should be looking. Did you solved this problem?